We are committed to helping and aiding our customers through the whole Testing process. We provide you with a complete package of tests and results to comply with all Health & Safety legislation. So if you are looking for a professional Testing service at a competitive price, we can help. A periodic inspection will reveal if any of your electrical circuits or equipment is overloaded and find any potential electrical shock risks and fire hazards in your electrical installation. 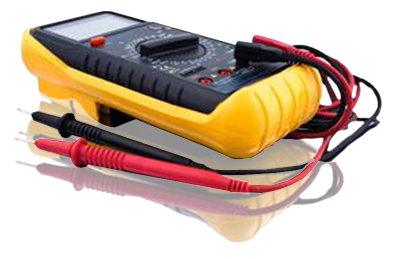 It will identify any defective DIY electrical work. It will also highlight any lack of Earthing or bonding. Tests are carried out on wiring and associated fixed electrical equipment to check that it is safe. A schedule of circuits will also be provided, which is invaluable for a property. Emergency lighting systems are installed to provide assistance in evacuating a building in the event of loss of supply to the general lighting circuits through fire for instance. Emergency lighting test and inspection requires that every circuit supplying an emergency light is isolated to demonstrate that the internal battery in the emergency fittings keeps the exits illuminated during power failure. Every 12 months a 3 hour run down test is performed to ensure the battery is capable of doing so for the desired period. Each light is inspected to ensure it operates correctly and that the lamp inside is sound. Furthermore the inspecting engineer will ensure that there are a sufficient number of lights and that the correct evacuation legends are fitted.